Are you sure you want to know? : What's Next? 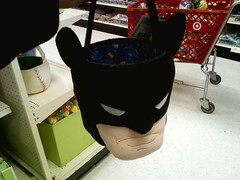 I can't believe that some parent is going to buy this decapitated head of Batman and give it to their child as an Easter Basket. St Patricks' day isn't even here yet and they're already stuffing fake easter basket grass on us. Is this what Easter has become? Well this and candy! Does anyone even remember what Easter is about any more? All of these holidays just run from one into the other, I give up! I guess anything to make a buck. Thats just not right.